Hello LadyVolNation. I'm back again, this time to introduce you all to the 1st of 3 newcomers to this high octane team. I'm going to put her stats up (via espn.com) * Height: 5'-11"
Ok, now from what I have read about Kamiko, basically LadyVol family, SHE'S A BEAST! 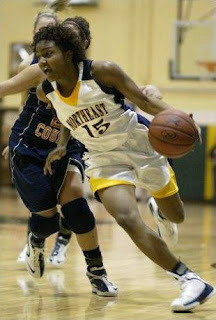 Summer 08: Five-foot-eleven Kamiko Williams from Clarksville, Tenn., has a versatile and at times explosive game. The combo guard for the GA/Lina 76'ers can take over a game with the ball in her hands and become a one man bad dream for defenses. She has the ability to play both the point and the shooting guard positions and has already committed to taking those skills to Knoxville and the University of Tennessee. The left hander's attack is aggressive and she's just as good in transition as she is in the half court. She can get all the way to the rim or pull up with the short jumper when the defense rotates. There are times that she will disappear on the floor and such a talented player can't afford to take plays off. She has too much to offer. (via ESPN) What I like is the fact that since she was 9yrs old she has wanted to play for the LadyVols, and now she has her wish: "I always had this feeling that I could do it," she said, after signing her national letter of intent to play basketball for the defending women's NCAA champions. "But there was a big part of me that said, 'Nah, it can't happen. Tennessee is too big.' I thought maybe I'd go somewhere a little smaller. But here I am." Yes, Kamiko here you are, and we can't wait for you to don that #4 LadyVol jersey. "This was a very different experience from high school, but I enjoyed it. In only a day, I was able to learn a lot and know what I need to improve upon. I've never had to play defense like this, so that was clear that I need to work on that part of my game. The coaches are all very good with details and communicating exactly what they want us to do." I love a kid who understands early that nothing comes easy, and to be a part of this team, defense will keep u on the floor. lol. So LadyVolNation hit Kamiko up on facebook, and show her some love! It is my belief that Kamiko will be Brianna's backup at the point guard position. Wow what a great problem to have, this team is incredibly DEEP! I LOVE IT.